Imagine sailing over High Falls. The wind whipping your hair, the spectacular view surrounds you. 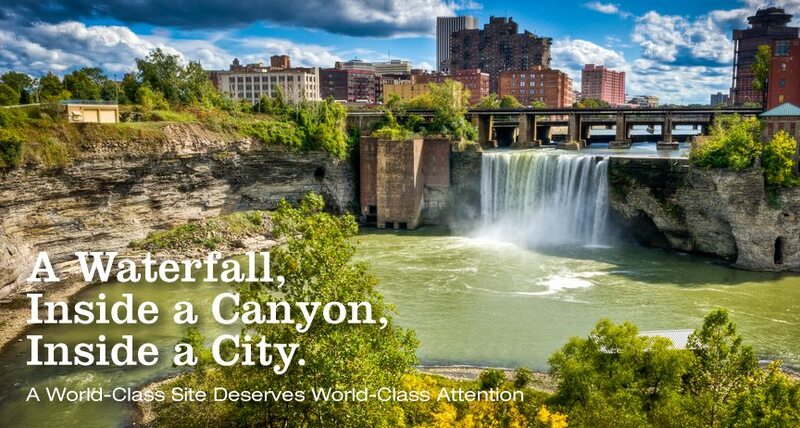 You start out from a promontory on the east side of the Genesee River and you zip along at a thrilling pace until you land on the west side near the bottom of the gorge that runs through the city of Rochester. That experience — perhaps the largest permanent zip line in North America — could happen as soon as the late summer of 2016, in Phase 2 of Greentopia’s GardenAerial project. GardenAerial aims to transform the Middle Gorge of the Genesee into a world-class showcase of sustainable and sensitive development in harmony with the natural beauty and ecology of the Gorge. (Phase 1, the FlourGarden in Brown’s Race, is due to be completed this fall.) Greentopia is spearheading the effort as it seeks the necessary approvals for take-off and landing spots, as well as additional grant funding. The state has already funded a feasibility study on greater public access to this area that will become the GardenAerial. Estimated cost for the ride is an affordable $20, a fraction of what Bellevue, WA., charges for a zipline in one of its urban parks. For an idea of what the High Falls zipline experience might be like and how it fits into the GardenAerial, view this video. See what WHAM-TV Channel 13 is saying about the GardenAerial zipline.